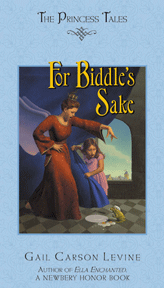 My favorite of The Princess Tales, this one is based on a fairy tale that hardly anybody knows, called "Puddocky." Puddocky used to be a word for toad. Can you guess why the fairy tale might be called that? I hope you'll read the original tale (and my version of course!) and find out why. The reader is taken along on a tour of the kingdom of Biddle, and I had fun naming the villages the characters pass through - Harglepool, Flambow-under-Gree, Lower Vudwich, and Craugh-over-Pughtughlouch, and more. My inspiration came from real towns in England, like Chipping Norton, Great Tew, Mickleton, Shipton-under-Wychwood, and Stow-on-the-Wold. I had fun with fairy names too. The main fairy in the story is Bombina, which is the actual name of the fire-bellied toad, and the fairy queen is called Anura, which is the name of the genus of frogs and toads. Few are aware of these secret meanings as they read!